In the past for St. Patrick’s Day, I’d made Chocolate Stout Cake (as both a Bundt Cake and as cupcakes), which I’ll probably do again with the leftover Guinness in my fridge. Yesterday I simply didn’t have that kind of motivation for the holiday, didn’t feel like doing anything complicated. 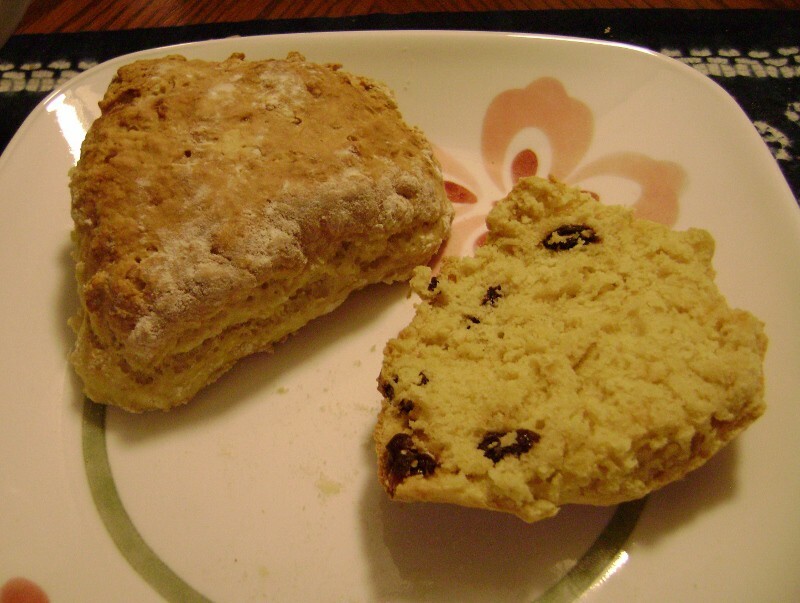 I still wanted my breakfast, though, so I decided to make Irish Soda Scones. This was probably the easiest thing I could have possibly done for breakfast that still involved baking from scratch. I always say that scones are easy – and they are, for me, I’ve made so many batches of them – but this recipe is more like soda bread. Simply mix the dough (flour, sugar, baking soda, salt, and buttermilk or sour milk, which I used). Scrape it out onto a (foiled or lined) baking sheet and shape it into a round. Cut into 6 wedges, separating them if possible, and brush with milk. Bake at 425F for 20 minutes. I made this a little more complicated for myself because I wanted to include raisins in some, but not all, of my scones. I made 2 half-batches of the scones, one plain and one with raisins. I got a little too much milk in the raisin batch, which made the dough a little slack. I scraped the dough out side by side so that I could make the dough into a single round, and then cut it into 6 wedges. These were better than I expected. I’m not a big fan of raisins, but I did enjoy the raisin scones more than I thought I would. These scones were tasty and tender, more bread-like than scone-like, and definitely needed honey or jam spread on them, unlike many other scones that I make. The scones have character from the buttermilk/sour milk, but they still go with anything you pair with them; I ate mine with honey, strawberry jam, mango butter, and fig butter, and the scones were good for all of them. This is about the easiest thing you could possibly bake. I can see myself making these scones any time I want a warm bread to go with dinner. If shaping them makes you nervous, simply make six scones by dropping the dough on a baking sheet like you would drop cookies. Give them a try.